This is fast becoming my absolute favourite to have on open-faced sandwiches for lunch…Especially on those days when i’m craving the taste of my old favourite- Tuna Mayonnaise! Can be whipped up in a few minutes, and devoured in even less. Recipe from 1,000 Vegan Recipes ~ slowly working my way through this book! – In a bowl (or processor), coarsly mash chickpeas. Add rest of ingredients up to Mayonnaise, mix well. Season with salt & pepper to taste. Cover, and put in fridge for about 30mins to let flavours blend. 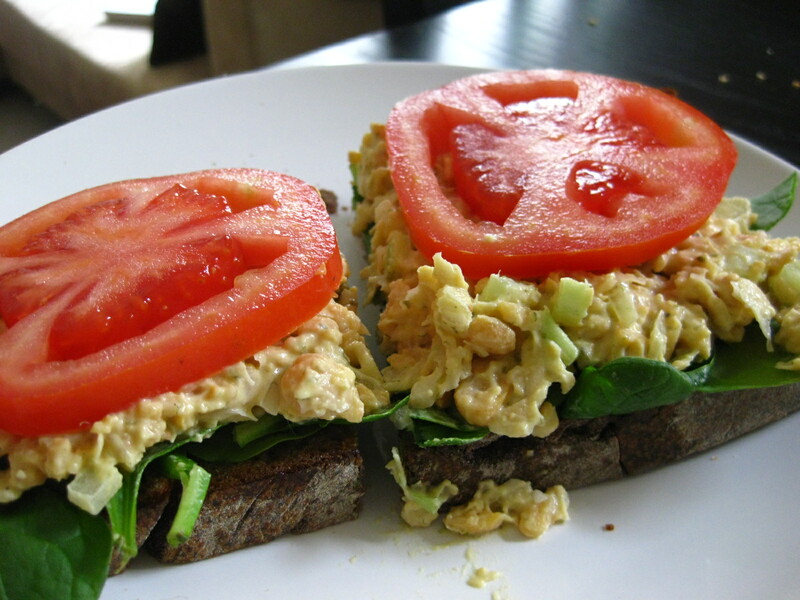 – To serve, layer Spinach leaves on buttered, toasted bread. Follow with chickpea mixture, and then top with tomato slices. Mmmmm, just like Tuna Mayo! I made this the other day when I was really craving a good ol’ sandwich. Here’s a pic! I substituted the mayo for raw caesar dressing and it turned out so well!